"Superfruit" A Day Keep The Doctor Away? With names like acai, noni and mangosteen, so-called "superfruits" certainly are exotic, but how "super" are they? Keri Glassman, registered dietitian and Early Show contributor offered a superfruit reality check. According to Glassman, a superfruit is "actually a marketing term for fruits that have high in antioxidants, high in nutritional value. So hence the word 'superfruit.' It comes from the word 'superfood.' It's not a scientific word. Some of them you may have heard of. They come from all different exotic places. Some of them you may have heard of are acai, noni, mangosteen or goji berry." Acai, noni, goji berry and mangosteen are actual fruits that claim to have health benefits. "Acai is known to be the 'beauty berry' because it's known to be good for your skin, hair and nails," Glassman told Early Show co-anchor Maggie Rodriguez. "Then we have noni, which is supposed to support a good digestive system. Then we have the mangosteen. Mangosteen is supposed to combat fatigue and help fight infection. And then finally, we have the goji berry. And the goji is supposed to support a healthy libido and make you happy. It's known as the 'happy berry.' Who wouldn't want that?" 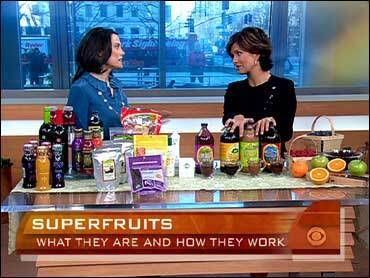 Although there is no conclusive scientific evidence to support the superfruits' health claims, Glassman points out that they are high in antioxidants, in which she is a huge advocate. "Goji is about 10 times higher in antioxidants than blueberries," she said. "I love antioxidants. I talk about that all the time. "We know that there's a lot of scientific evidence supporting the fact that -- or claiming, supporting that antioxidant fruits such as all -- we know blueberries and raspberries that they may prevent disease and help prevent aging as well. However, the specifics to these fruits are not at this moment proven." The downside of these superfruits is their cost. The noni goes for about $39 for a bottle of juice and at least two ounces a day is suggested, Glassman explained. Acai can also be found as a powder. Glassman points out that a lot of people are adding the superfruits into other juices now, but the first ingredient might be another juice and sugar. "How much of the real goji or real acai are you going to actually absorb?" Glassman asked. "So if you are going to spend that money, spend it on the real thing and get that 100 percent juice." Glassman stresses getting in two cups a day of real fruits. "We know blueberries are good for us, raspberries are good for us, and they are high in vitamins and minerals, which is so important," she said. "So if you want to add on the expense, you want to up your nutrition a little bit, and you want to spend the money, do it. If you can afford it, do it. First, make sure you get your fruits in every day."